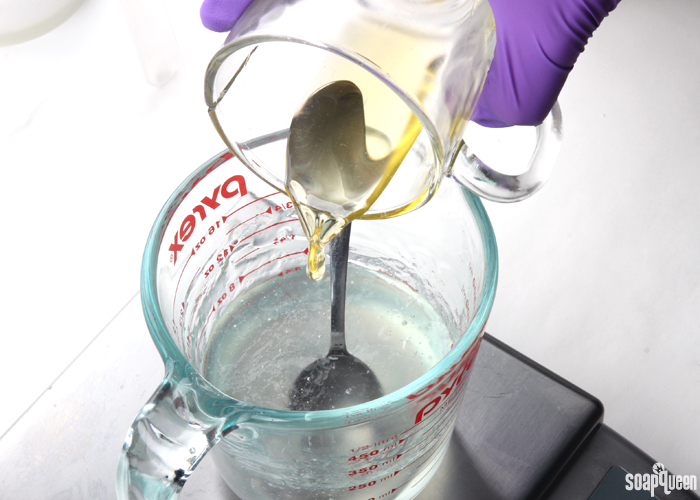 ONE: In a small container, mix together the liquid glycerin, castor oil, and LoveSpell Fragrance Oil. Stir until all the wet ingredients are completely combined. TWO: In a separate container, add the dry ingredients (baking soda, cream of tartar, corn starch, tapioca powder and SLSA) one by one through a fine mesh sifter and into a large bowl. 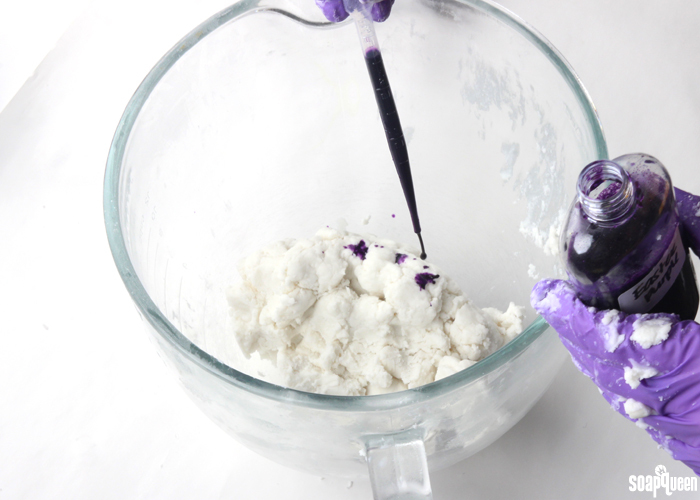 The sifter ensures the mixture is completely smooth and clump free. I recommend adding the SLSA very last. 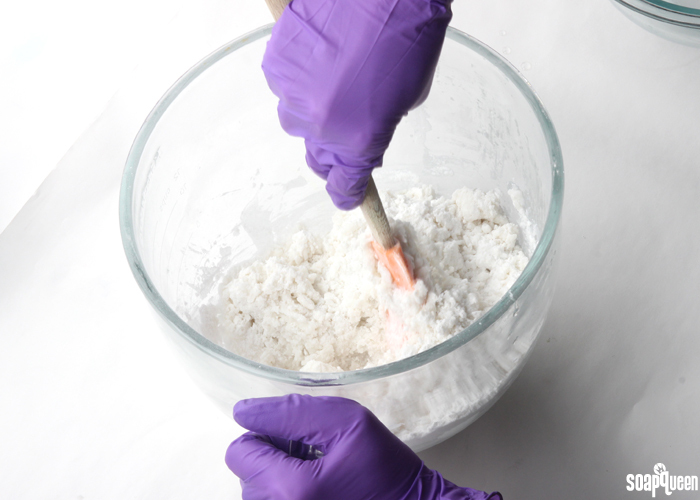 SLSA is extremely fine and powdery, and can become airborne very easily. You may want to wear a mask during this step to avoid breathing in any SLSA. 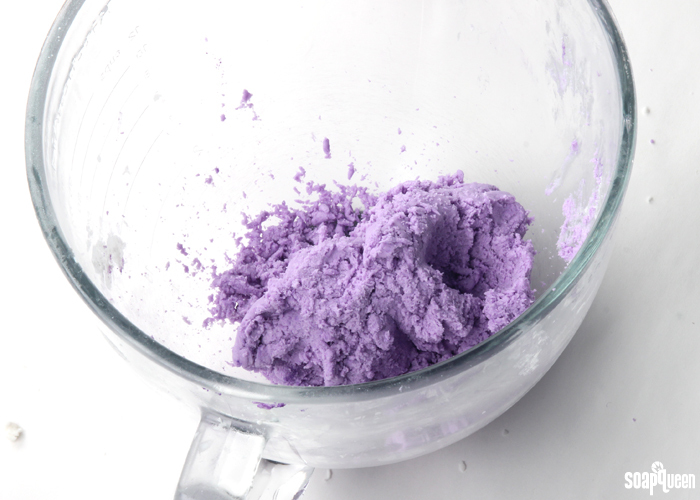 Once all the ingredients have been added, slowly mix together the dry ingredients. THREE: Pour the wet ingredients into the dry, and slowly work the ingredients together. 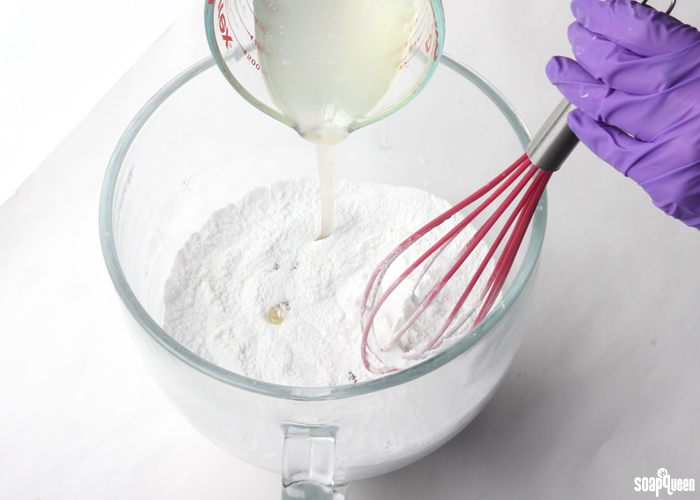 A spatula or your hands is the best way to work in the wet ingredients. 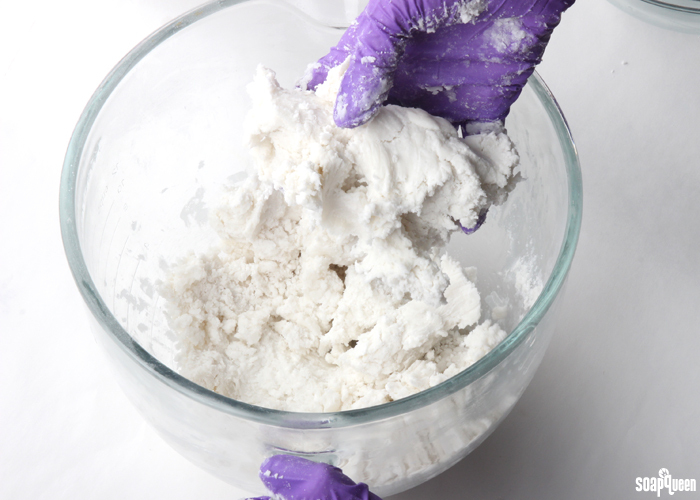 FOUR: Once the dough is thoroughly mixed, divide it in half. 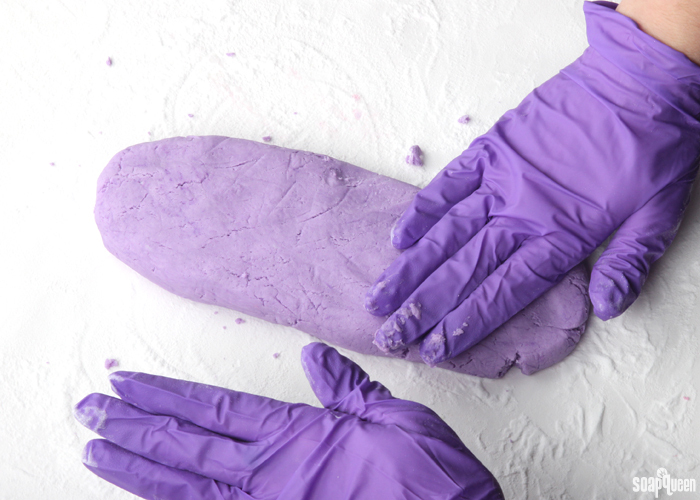 To one half, add 12 mL Eastern Purple LabColor and use your gloved hands or spatula to thoroughly mix in. 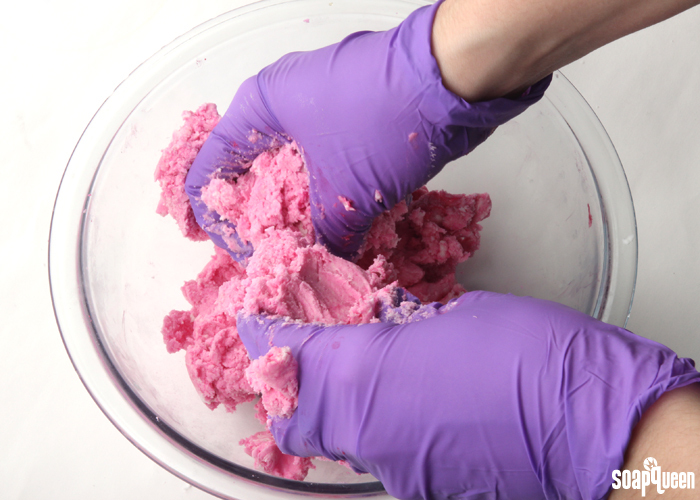 FIVE: To the other half, add 6 mL of the Pinkberry Sherbert diluted LabColor and use your gloved hands or spatula to thoroughly mix in the colorant. SIX: Prepare your tabletop. Place a large piece of freezer or parchment paper on your work space. 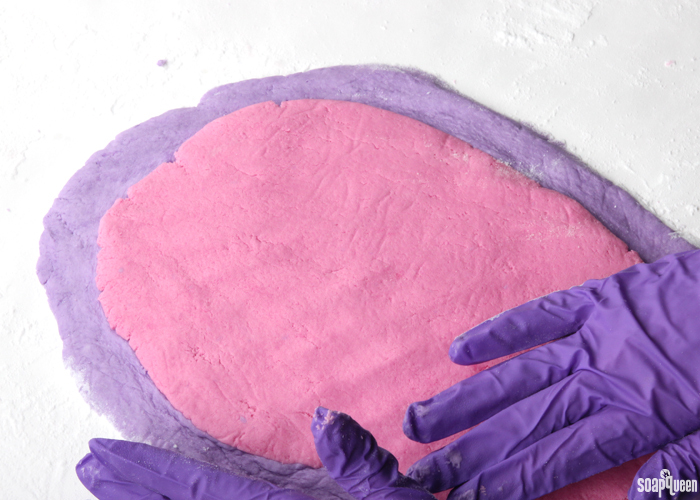 Then, lightly cover the paper with a dusting of baking soda. You don’t need a lot, just enough to keep the mixture from sticking to the paper. 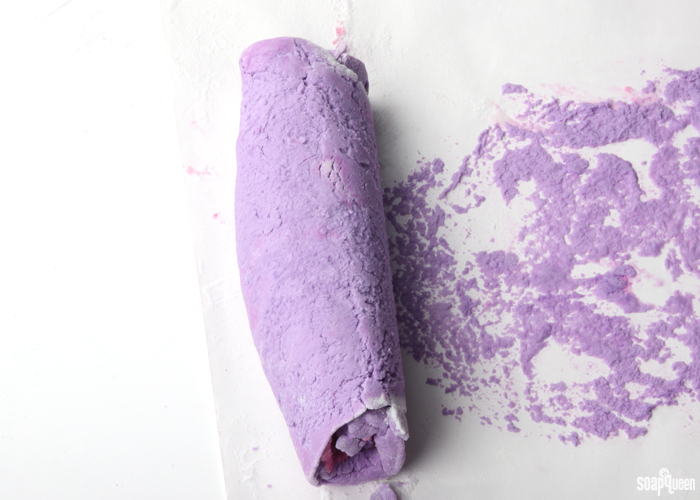 Then, take the purple “dough” and form a long log shape. 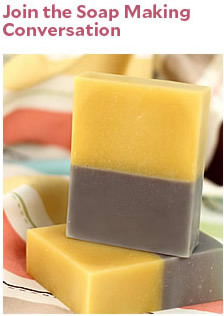 Use your hands to flatten and spread the mixture. 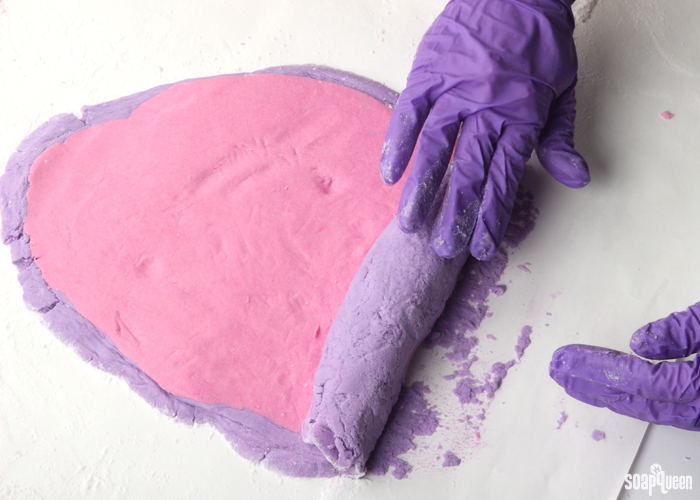 SEVEN: Place the pink dough on the top of the purple, and spread it out until it almost completely covers the purple. It’s okay if there is a little purple still sticking out! 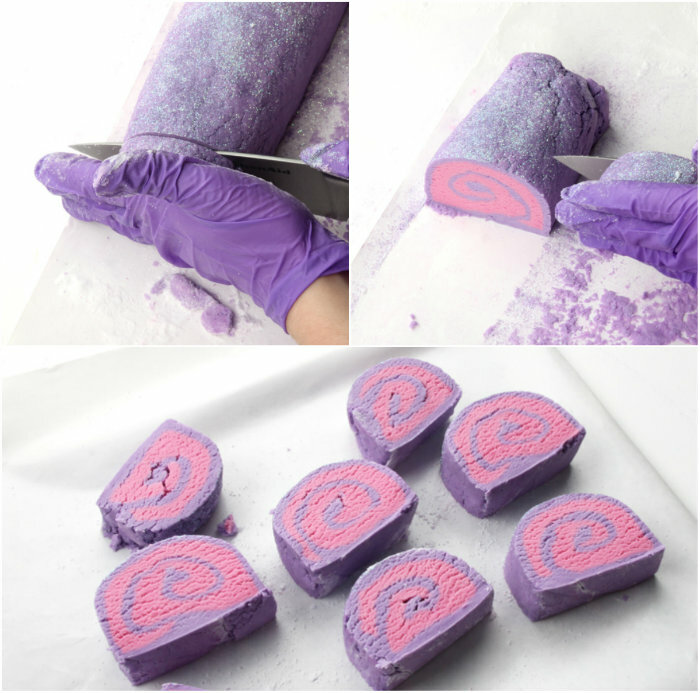 TIP: If you’d like the layers to be super smooth, cover the top with another piece of freezer or parchment paper, and use a rolling pin (or other round tool, like a Heavy Duty Column Mold!) 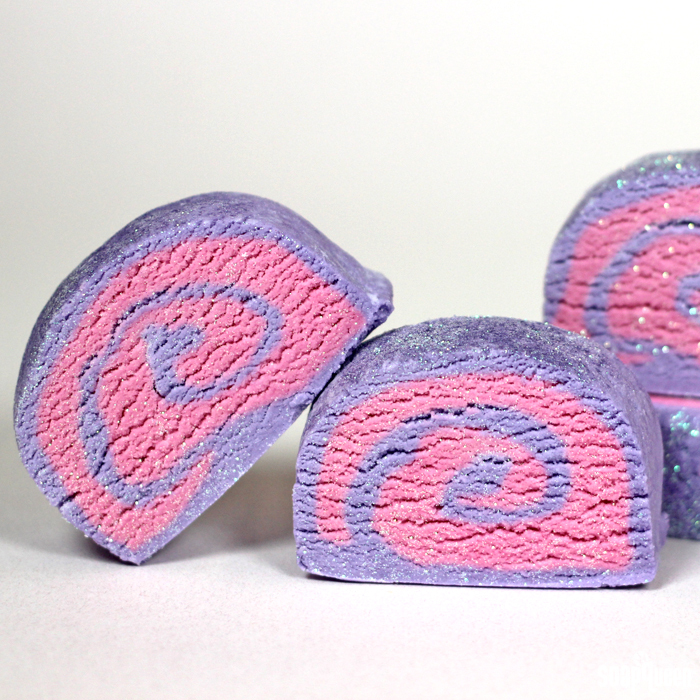 to gently roll out and smooth the layers. EIGHT: Now it’s time to roll! Starting on the side closest to you, begin to roll the dough up. 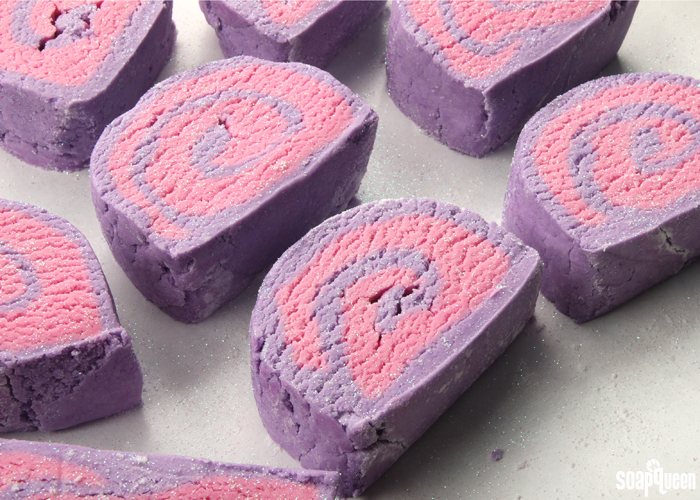 With every roll, gently peel the paper back, then continue rolling. 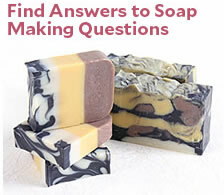 For this step, I would recommend checking out the Bubble Bath video on Soap Queen TV to get a better idea of this process. 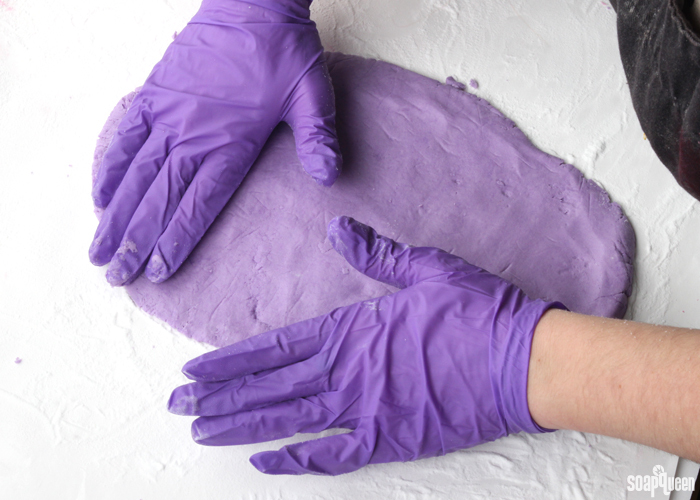 NINE: Once the dough is completely rolled up, use your hands to gently press the layers together and compact the roll. 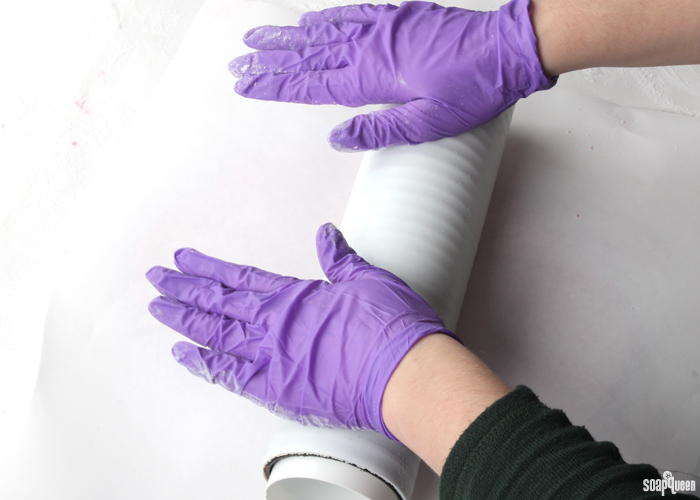 You can also transfer the roll to a clean piece of parchment paper, and roll again as you shape it. 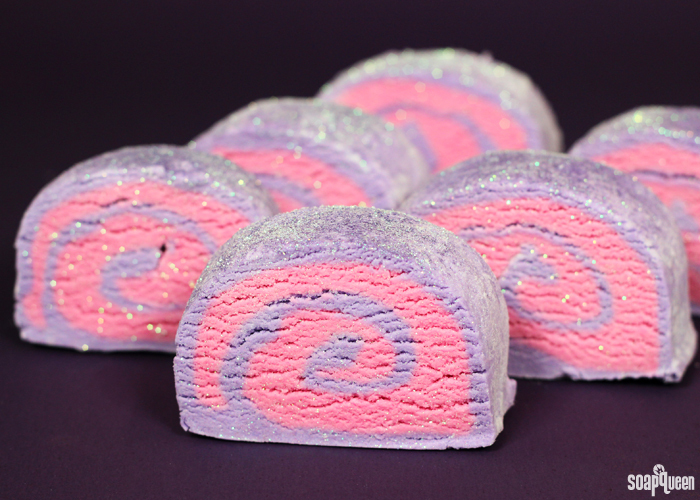 TEN: Sprinkle the top of the roll with Lavender Mica and Fine Iridescent Glitter. ELEVEN: Use a sharp knife to carefully cut the roll into bars. 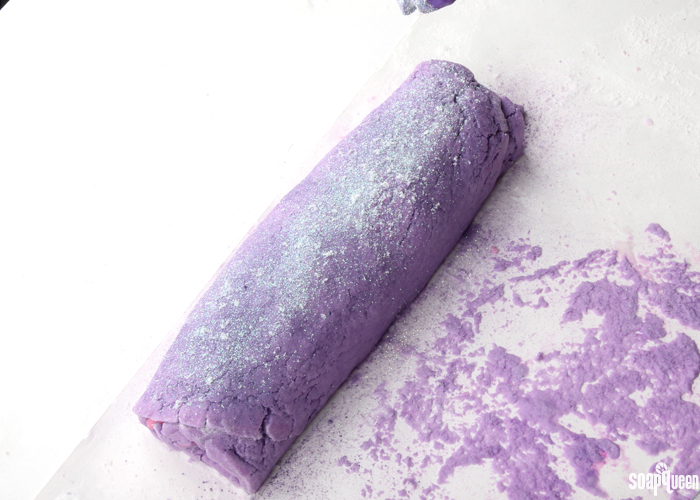 Transfer the bars to a clean piece of parchment paper and sprinkle with more glitter. Be very careful when handling the bars, as they will be very soft and very delicate. Allow the bars to lay out for at least 3 days to harden. Depending on your climate, they may need over a week to fully harden. 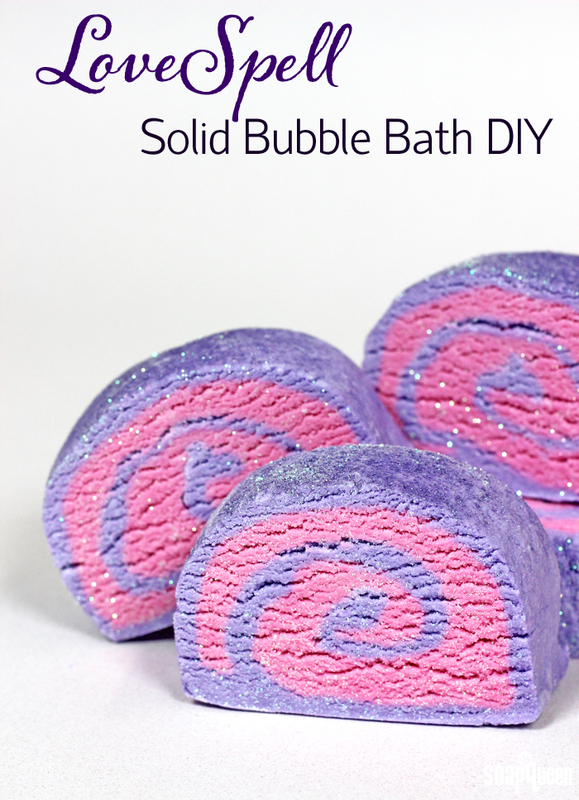 To use, crumble the bars and place them into the tub while the water is running to create the fluffiest bubbles. Enjoy!